I wore this look just before the Habagat struck and ruined a lot of lives and livelihood. I hate it when it storms. I get this little panic attacks that is just too difficult to bear. But I'm grateful that everyone in my family are okay. My dad stayed with us for a couple of days which I'm grateful for because the storm really did a toll in Marikina and I'm glad my dad didn't have to stay there alone to deal with the flood. Now that everything is getting back to normal, I suddenly don't feel well. My allergies are getting worst and I fear it might be because of the dogs. :( I had a hard time breathing last Friday that I was rushed to the ER. Now I have to use a nebulizer to help with my wheezing cough. For the past two days, I've been feeling this tightening in my chest and I'm scared to have it checked out. I fear I damaged my heart since I couldn't get enough air to it coz my cough. :( I really am scared that I'm sick... I am hoping for a miracle that all will be well tomorrow. 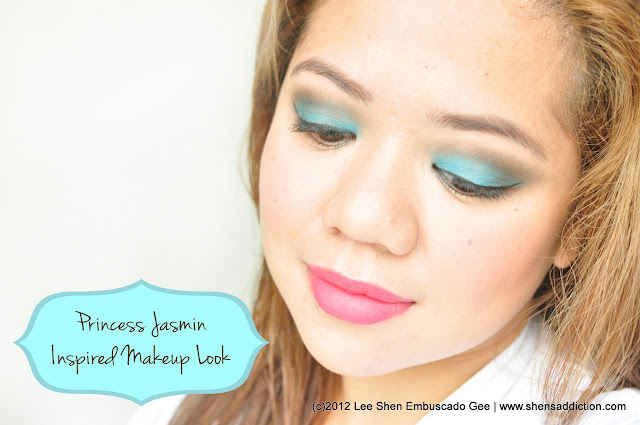 On a lighter note, I got inspired to create this look while I was browsing through Instagram and saw someone create a teal/aquamarine eyes inspired by Princess Jasmin. So the next morning, I went ahead and created one using my Beauty Pro Palette and Double Stack Matte Eyeshadows and Blush Palette. I hope everyone is safe now from the flood and is doing well, getting by and surviving the aftermath. I wish it's Summer all over again. It's much better when the sun is shining.